There are endless plants and herbs that can be used to make tea, and many of these teas have great effects on your health. Fennel tea, for example, has a number of potential health benefits. From helping with weight loss to boosting your immune system, fennel tea may be able to aide you in all sorts of ways. In this article, you will discover many of the ways fennel tea can be a benefit to your health, fennel tea side effects, and even how to make fennel tea by yourself. Think of this as your beginner’s guide to fennel tea. Fennel is a herb that originates from the Mediterranean. It’s been used in everything from cooking to medicine, so it’s not much of a surprise that fennel tea may hold a number of health benefits that are worth taking a look at. Drinking fennel tea may help reduce water retention as it acts as a diuretic, helping the body with urine creation. This can lead to minor weight loss. Frequent urination may also help flush out excess minerals that we don’t need. However, watch out for signs of dehydration such as excessive thirst, dry mouth, or weakness. Fennel tea has long been used as a digestive aide. Fennel tea can help relax the digestive tract, which eases digestion. This may also help with stomach issues connected to irritable bowel syndrome (IBS). Fennel’s anti-inflammatory properties may help with inflammation problems like arthritis and gout. We’ve all woken up with puffy eyes at one point or another. Fennel tea can help you take care of that, but perhaps not in the way you’d think. In this case, you make the tea, but instead of drinking it, take two cotton balls and dip them into the tea. Place them on the puffy area and leave them be for 10 minutes. This should help quell the puffiness. Fennel tea has a number of antioxidants that may help lower bad cholesterol as well as help lower your blood pressure. These two things can help the heart out greatly. Fennel has been used as a natural breath freshener for a long time and fennel tea carries similar breath-freshening properties. Fennel tea may also lend a helping hand to the immune system as it has antibacterial, antiseptic, and anti-fungal properties. These may be excellent for helping you snap you out of a cold as well as preventing you from getting one in the first place. As you can see, the benefits of fennel tea are pretty widespread. However, before you go adding fennel tea to your diet, there are also a few side effects that you should be aware of. With all of the previously mentioned health benefits, it may surprise you that fennel tea does have some side effects. While most of them are things you should keep in mind some of them could have some very bad consequences. According to University of Michigan’s health center, fennel tea could endanger women’s health due to its ability to mimic estrogen. Women with estrogen-dependent cancers of the breast or ovaries run the risk of fueling the cancer with fennel tea. It’s also not recommended for women who are pregnant or breastfeeding. For a number of people out there, fennel tea may be off limits due to an allergy to fennel. This allergy usually results in an itchy throat and other similar symptoms. If you have an allergy to carrots or celery, you may want to proceed with caution when it comes to fennel tea. Fennel tea may also interfere with some medications, especially estrogen-based drugs like birth control pills. Fennel tea may be harmful for those who have had issues with a seizure disorder like epilepsy, as it may actually increase your chance of having seizures. Now that you’ve seen all the health benefits, looked at all the possible negatives, and possibly consulted with a doctor, you are ready to brew your first batch of fennel tea. How do you make fennel tea? Is there a particular water to fennel ratio that you need? Don’t worry, we’ve got some suggestions for you. So, you want to start drinking fennel tea on a regular basis to reap the benefits, but you want something quick and painless. You’re in luck, because we’ve got a simple recipe that you can easily make within the confines of your own kitchen. A mortar and pestle to crush the seeds. Take the fennel seeds and place them in a bowl (or use a mortar and pestle for best results). Crush the seeds into a powder. Alternatively, you can use a cutting board and a rolling pin but a mortar and pestle will be easier. Take 1-1/2 tsp. crushed fennel seeds and drop the powder into a mug. Pour a cup of boiling water over the crushed seeds. Allow the water and seeds to steep for seven to 10 minutes. After steeping the fennel tea, enjoy. Feel free to use milk and honey in order to sweet the taste. Cumin and coriander have similar uses as fennel when it comes to health benefits. The following tea is a bit more complicated but adds a little variety to your fennel tea regimen. Place the fennel, coriander, and cumin seeds in a coffee grinder or mortar, and crush them into a fine powder. Place this powder and the water in a small saucepan and bring to a boil. Simmer for five minutes until fragrant, and remove from heat. Allow the brew to cool to warm, and then strain through a fine mesh metal strainer and drink. This is also pretty good served cold over ice. 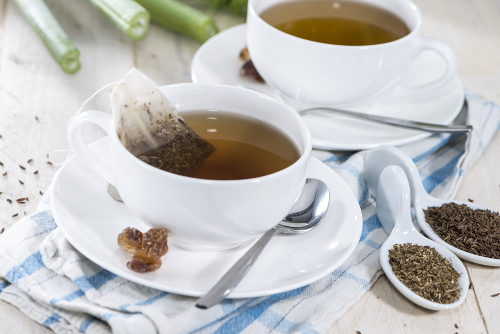 Fennel tea has numerous reported health benefits that could improve your lifestyle and diet. But there are some possible side effects. If you aren’t sure whether fennel tea should be added to your diet, consult with your doctor, who will help you make the right choice for you and your health. “15 Fennel Tea Benefits And Who Must Not Consume,” CureJoy, February 28, 2017, http://www.curejoy.com/content/fennel-tea-benefits-and-who-must-not-consume/, last accessed March 21, 2017. Uddin, R., “Fennel Tea Side Effects,” Livestrong, October 14, 2015, http://www.livestrong.com/article/371328-fennel-tea-side-effects/, last accessed March 21, 2017. “What Is Fennel Tea Good For?” Flatulence Cures, http://flatulencecures.com/what-is-fennel-tea-good-for, last accessed March 21, 2017. “11 Amazing Benefits Of Fennel Tea,” Organic Facts, https://www.organicfacts.net/health-benefits/beverage/fennel-tea.html, last accessed March 21, 2017. “Fennel Tea,” The Right Tea, http://www.therighttea.com/fennel-tea.html, last accessed March 21, 2017. “Cumin Coriander and Fennel Tea for Digestion,” Wellness Mama, February 28, 2017, https://wellnessmama.com/119233/cumin-coriander-fennel-tea/, last accessed March 21, 2017.